Instagram can be a total pain to grow. With more users signed up than ever it has led to increased competition and it’s easy to get lost in the crowd. As more people use it as a source of income there are also lots of people scheduling their posts and rarely even logging in to engage with others so more users doesn't necessarily lead to a larger audience for your posts. Why is it so difficult to grow on Instagram? What problems do bloggers face? 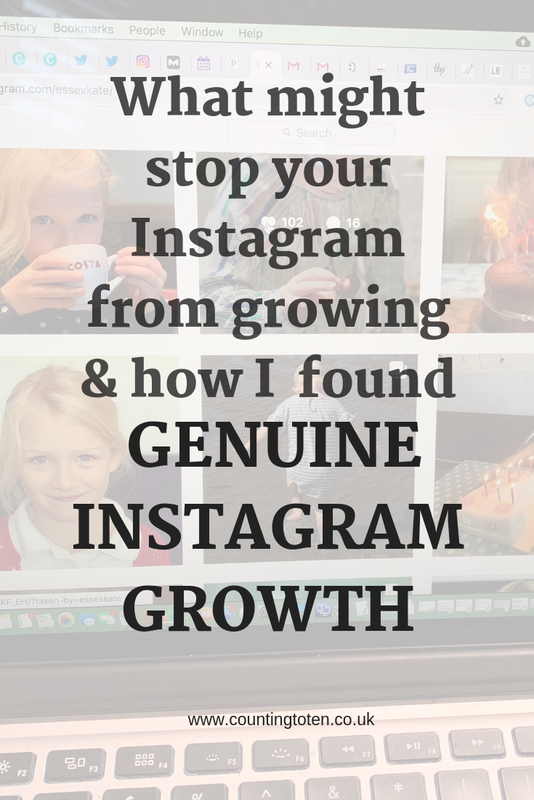 And how can you grow your Instagram in a sustainable and risk free way? After experimenting for a few months I have finally got my account to start growing again. 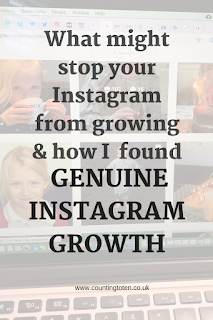 This post talks about why so many of us have problems growing our Instagram accounts and what the answer is for sustainable growth. The historical (and sometimes current pressure from Brands for high numbers of followers over engagement resulted in many bloggers, including myself, trying tactics to increase our follower count. I’ve never bought followers or likes, but really that is just the extreme end of a spectrum to artificially inflate figures. I’m talking about growth through giveaways, follow threads and (argh SO ANNOYING) follow/ unfollow . When combined with the algorithms used since the feed moved away from chronological order this has the impact that reach and number of likes is often low. Why? I’m not going to claim to be an expert on Instagram algorithms, I don’t think even Instagram fully knows how it works, but a key part is the response to the post from the initial followers who see the post. If a large percentage of your followers aren’t genuinely interested in your posts it means they won’t engage, if they happen to be the majority of the first people shown your new post Instagram will assume it’s not very interesting. After all if your followers aren’t interested who will be? Inevitably brands and bloggers had to fight back and there has been an explosion of pods and instants where you share your Instagram post and are expected to like or comment on everyone else’s. The instants in particular are designed to beat the algorithm because having a huge influx of likes straight after posting does seem to give the post an extra boost, and even if it doesn’t you get a number of likes that you wouldn’t have otherwise got. Some of these threads result in a boost of 1000 or more likes! I’m not knocking these groups and I occasionally used them up until 6 months ago. When you are in a relevant group it can be nice because you get to see the posts from many people you follow whose pictures may not have appeared in your feed for a while. When they are in the same niche it also means any advertising they share is likely to be of interest. On the flip side some of the larger groups cover multiple niches so they will be full of pictures you wouldn’t normally like and they are often American which will heavily sway the demographics of the people who like your posts. There is also now a programme which allows you to automatically like all the posts linked to in a thread so people don’t need to even see the image you posted. Understandably Instagram has started to crack down on pods and instants. It isn’t difficult for them to see where traffic for a post is coming from and there are rumours of groups being closed by Facebook and even people losing their Instagram account. Whether you get income from your Instagram images or not the idea of losing all your images and history is horrible. How much this is true I don’t know, but I suspect using these artificial methods causes Instagram to suppress your subsequent posts and that was enough for me to stop using them. Like many bloggers I feel the trap of instants and pods because your likes will inevitably go down when you stop using them relying on you having to go back to the time intensive basics to grow your Instagram: good pictures, interesting captions and engaging with others. It is frustrating when you see the success others are having continuing to use them, and making your feed look bad in comparison. This is particularly noticeable when working on the same campaign as others, and while I don’t think it’s always an issue for a brand (their product can still be exposed to more potential customers regardless of the method) it is likely to stop those who don’t use boosts from being selected for future campaigns. So What Is The Answer For Genuine Instagram Growth And Engagement? I reached a point several months ago where I knew I had to do something if I wanted to keep monetising my Instagram and I was very tempted to start again from scratch. There are a number of people with beautiful feeds who have gained an engaged following quickly by doing it the right way, but many more are struggling to get more than a few hundred followers so I decided to keep my old followers and grow from there. The number one reason people will like a post or follow people is they like the images. The people whose feed will grow fastest will be the ones with the most beautiful or interesting images, particularly those with a theme or style which stands out from the crowd. 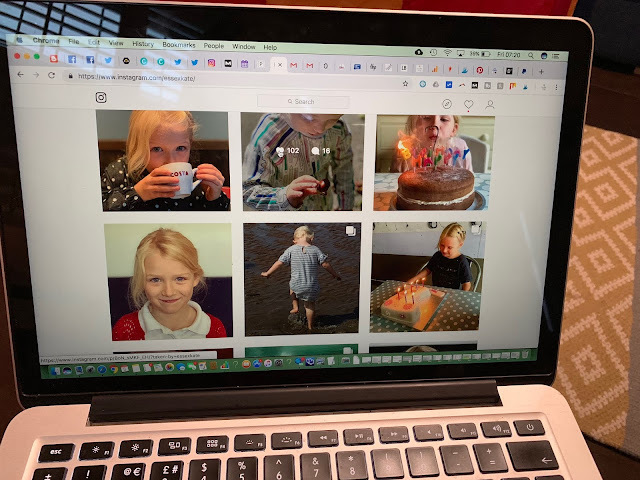 I am not one of these bloggers and the more I worry about the quality of my photos the less I post so I have decided to have a feed full of images that reflect me and my life. Ultimately it’s more important to post something than nothing. As people spend less time on Instagram they are less likely to read the text accompanying an image, but that doesn’t make it less important. The text with a photograph is often what will lead people to comment, but it is also a great chance to share your personality. If people connect with you they are more likely to follow you, like your images and engage in future. Don't make your captions too long, ask questions and try to draw people in within the first couple of lines. With the millions of people on Instagram there will be a good chunk of people who will like your images whatever your style you just need to find them, which is where hashtags come in. You don’t want to use any that are too common because your post can get lost so it will need some experimenting. There are hashtags that are used a lot by bloggers (which is great because some bloggers will engage in the hope that you will reciprocate) and there are hashtags used by “normal” people. The non-bloggers can be the most valuable and lead to new followers who aren’t following thousands of others and are more likely to see your future posts. You can find posts suggesting good hashtags for different niches, but these often get targeted by businesses which dilute their relevance. I have seen articles claiming you should use less hashtags and to put them in the first comment etc etc, my approach has been to use 30 on every photo and I mix them up so I'm not always using the same ones. I use some which have around 10k images and a few up to 3 million images, more than that and the feed is so fast moving you probably wont be seen. While the feed is no longer chronological the interaction with a post shortly after it goes live is important so finding the peak time for your engaged followers is really useful. This will vary depending on niche and the location of most of your followers. As a family blogger I find a lot of people who are interested in my posts will be online first thing in the morning, shortly after the school drop off, nap times and from about 7pm when children have gone to sleep. If you are a lifestyle blogger it is more likely your followers work 9 to 5 so during the commute, lunchtime and evenings should work well. Amusingly Friday night can work well for me because everyone is home relaxing, but I imagine for the typical lifestyle blogger their followers are out socialising. Don’t be put off if you get less engagement in school holidays or sunny weather, look at trends longer term. The ultimate time sap, but if you are doing all the above it is the best way to grow. The more time you spend on Instagram liking the posts in your feed, leaving genuine comments (not "nice pic") as well as going through hashtags you use and engaging the better results you will get. It is inevitable because you are coming to the attention of more people and logically Instagram will reward those who engage with others because that’s what Instagram is all about. Some people claim that using stories can help your growth and engagement, but I’m not convinced. I find different people tend to watch my stories regularly than like my pictures and many people tend to mainly focus on one or the other. Do stories if you enjoy them and you should find more people watch them and ultimately follow you for them, but if you don’t enjoy them you would be better off focusing on engagement on your grid photos. To grow through stories make sure you use one or two hashtags in your stories as well as tagging with locations, this will mean your story is shared with a higher number of people and potentially gain you more followers. For every genuine new follower I get there are probably 3 or 4 accounts that will follow me and then disappear a few days later. I have an app where I can see who has unfollowed me and it mostly amuses me. I rarely look at the accounts of the people that follow me, but I do visit the accounts of everyone who likes my posts and those that leave genuine comments. I will follow the accounts that I like best and that way it doesn't bother me too much if they unfollow me later. It surprises me that people seem to think I will follow them back just because they have followed me even though they haven't engaged at all. I'm not interested in accounts that don't engage. Which leads me too the final step which I haven't been brave enough to do yet, but good friends have done it with great success. You can go through your follower list, click the "..." next to their name and select "remove" to remove them from your followers. If you remove the bots, dodgy looking people and people that don't engage you will end up with your percentage of engagement going up and you are likely to grow faster. Obviously you are taking a short term risk by reducing your number of followers, but people who have tried it have found it to pay off. You can get apps which show you who doesn't engage with you, but be wary of trusting them 100%. Many of them only start recording information from when you first install them, lots can't pick up data from followers with private accounts and some I have just found to give nonsense data because I recognised the names and new they had engaged. It can give you a starting point of who to look at further though. I would also suggest trying to engage with genuine people first because they might not be seeing your posts due to the algorithm. If they liked your content once there is a good chance they will like it again if you bring yourself to their attention. Finally what can you do if a paid post (#ad) is bombing? Before turning to pods, instants and other similar options there are a few things you can try. The key is to expose your post to more people without them being under any obligation to like your post. It's worth mentioning the post in your stories in a teasing way which encourages those watching to go to your grid and spending as much time engaging with others as you can because a percentage will check you out in return and probably like some of your most recent posts. The fastest option to make a difference though is to promote your post. It feels a bit wrong to pay Instagram (well Facebook) to show your post to more people, but it is quick, you wont be penalised for it and any likes or comments will be genuine engagement. Spending a small percentage of the money you will be paid for the post seems a reasonable investment. I have only promoted a few posts and I have found more success promoting it via my Facebook page than directly in Instagram. You are given the option to "Boost an Instagram Post" when you look at your Facebook page and you can then choose demographics and how much you want to spend etc. Do you have any other suggestions for how to grow your Instagram? What have you found works well? Please let me know in the comments. This is all so true. There's certain people that grow really fast - it either is down to huge instants and threads, or a specific niche/occasion like having a baby. I don't do either of those, and now I'm not even sharing pictures of N (he was getting a bit old to get lots of likes even before he refused to be on there anyway), I find people tend to comment more but not follow. Even non-bloggers just don't seem to follow. Upping the engagement is the only way to do it, just such a shame there's only so much time in the day. Thanks, this is just the sort of thing I was looking for when I posted in the UK Parent bloggers group. It all seems a bit clearer now! Really interesting - especially about dumping some no-value followers - I'm not sure I'm brave enough for that but it makes sense! Thanks for taing the time to put this article together.